Diddy Wa Diddy, Texas, AKA Juliff, Texas, Texas Gulf Coast Ghost Town. 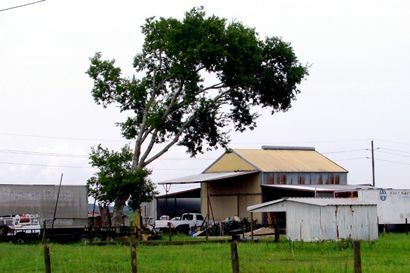 Prior to the Civil War the area had been part of the Arcola Plantation (see Arcola, Texas) and was a shipping point for area cotton. 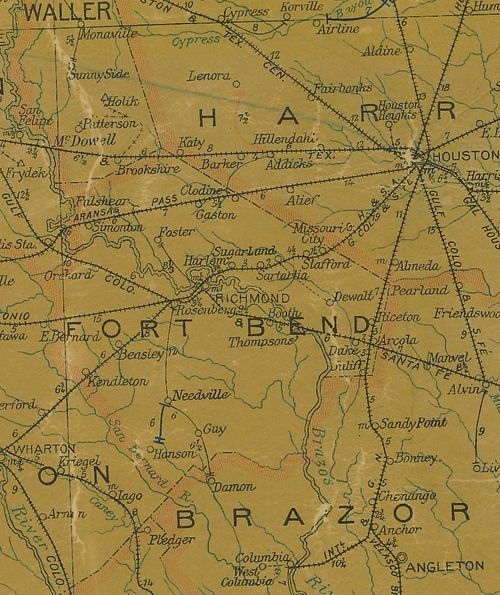 It throve until the arrival of the Houston Tap and Brazoria Railroad in 1858. 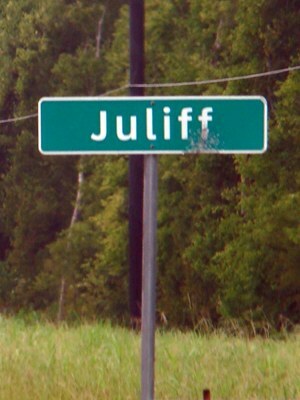 The town was named for early settler John J. Juliff ("Triple J" to his friends). The town was granted a post office in 1891. It closed in 1908, reopened in 1914, and then closed permanently in 1958. During the Great Depression several saloons and a dance hall were opened alongside the railroad tracks. The landlord was one Thurman "Doc" Duke.With these unsavory businesses serving as the community's nucleus, things went from bad to worse. Juliff did have a church, but the congregation was outnumbered by drunks, gamblers and prostitutes - with some residents performing combinations of these roles. Needless to say, they weren't often called for jury duty. According to the Handbook of Texas, around 1934 a local musician was sober enough (or drunk enough) to write a song (supposedly) about Juliff. The lyrics "Diddy Wa Diddy - "ain't no town - ain't no city" don't mention Juliff by name and folklorists say that Diddy Wa Diddy is a reference to a mythical place (like the Big Rock Candy Mountain was to Hobos) where there's abundant food and no work. Other sources attribute the song to Arthur "Blind" Blake, a guitarist from Jacksonville (Florida, not Texas) who recorded at least two versions of the song before disappearing around 1931. Since Blind Blake's recordings are still around, we have to assume that the unnamed musician in Juliff was just one in a long string of people who used the lyric. In one version of the song, the singer declares "I just found out what Diddy Wa Diddy means" while in another the singer pleads: "Won't somebody tell me what Diddy Wa Diddy means?" The words were also used as a title (Diddy Waw Diddy) by Texas Author/ Journalist Billy Porterfield (who was no stranger to places like old Juliff). Despite the tenuous link to that well-known song, the town was down to 40 residents by 1940. It reached its high-water mark in the late 40s with about 150 people. By the early 60s, the saloons had all moved to Richmond's notorious Mud Alley or the Wards of Houston. Today only bloodweed and a few scattered houses occupy the area. Perhaps the old saying about the mythical town is true: "Everybody would live in Diddy Wa Diddy - if only it wasn't so hard to find." And if only Juliff could've collected royalties...it might still be there as a tourist attraction. Anyone who would like to share stories, memories or information about Juliff, Texas, the current whereabouts of Billy Porterfield, the meaning of Diddy Wa Diddy, or the disapearance of Blind Blake, please contact the staff of Texas Escapes. Tell them Luke sent you.